This particular book has been on my “to read” list for quite a while after I saw that Neil Gaiman recommended it. The plot revolves around a man named Bax — a scholar many times over, a cheat, a sometimes fraud, and a recently released convict. He has no money and so, after drifting a bit, takes up residence in what he presumes to be an abandoned house. He soon discovers that the house has claimed him as its own, and so he must deal with all the sorcery, monsters, mystery, and family lineage that accompanies it. The only question is to whom the title refers. Is it the previous owner of the home … or Bax himself? This book is unusual in that is is comprised of a series of letters written mostly by Bax himself. Due to this method, we get to know Bax very well, or at least the persona he wishes to display to the recipients of his letters. These letters make for a very fast, entertaining read. However, because Bax is essentially a first-person narrator, I sometimes found myself distracted by his near omnipotence. It’s a tricky thing to write a book in this manner, and, at times, Bax seemed to know too much which resulted in the letters feeling less like correspondence and more like actual chapters. Even with that being said, I did enjoy the story’s trajectory. It felt different in that it did not conform to the typical third act showdown. Characters came and went without much fuss, which is how I would describe this book as a whole — it doesn’t make too much of a fuss. It handles some rather epic concepts humbly and without much of a to-do. I found that restraint rather charming, actually. 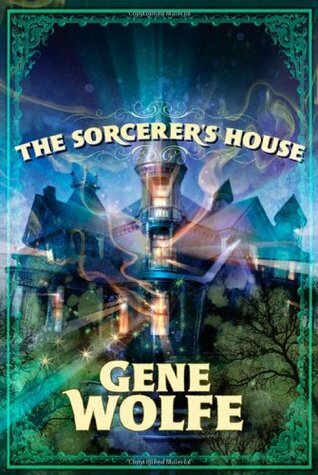 I’m glad Neil Gaiman, a literary hero of mine, thinks so highly of The Sorcerer’s House. I apparently did not enjoy it as much as he, but if you think highly of Gaiman, I urge you to give it a try for yourself. This entry was posted in Book Reviews, Uncategorized and tagged books, entertainment, Fantasy, gene wolfe, Neil Gaiman, read, review, the sorcerers house.